On Thursday, Nov. 18 Logan Elementary School hosted its annual “Taste of Asia” dinner. The school’s PTSO put on the event, which featured food made and donated; an estimated 200 were served dinner during the event. The evening also included a book fair, which was also a fundraiser for the school’s PTSO. See a short slide show of the evening above. 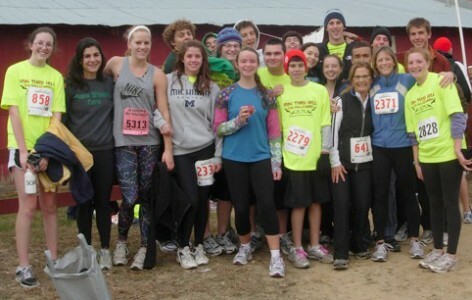 Members of Community High School ran through Hell, Mich. this fall. Thirty eight Community High School students participated in the annual Halloween Run Thru Hell 5k and 10K races in Hell, Mich. According to physical education and health teacher Robbie Stapleton, all of the students participating were from the Personal Fitness classes at Community. Most ran the 5K, but about 10 did the 10K, she said. Eastern Michigan University is hosting an information meeting about the Early College Alliance program for interested students (current ninth- and 10th-graders) and their parents. The meeting is scheduled for Thursday, Dec. 2, from 7-8:30pm in the Little Theater at Pioneer High School. For full details, visit http://www.emich.edu/eca. On Saturday, Oct. 23, 49 seventh-, eighth- and ninth-grade singers from the Ann Arbor Public Schools traveled to Monroe to participate in the Michigan School Vocal Music Association Regional JH/MS Honors Choir. Huron High School seniors Danny Clegg and Kris Shin were selected from applicants across the country for the 2011 American High School Honors Performance Series at Carnegie Hall where they will be a part of the honors orchestra as violinists. Participation is limited to the highest-rated high school performers from across North America. The two were nominated and auditioned individually and were accepted after a review by the Selection Board committee. They will join other performers from the United States and Canada for a special performance at Carnegie Hall. Clegg studies violin with Kimberly Kaloyanides Kennedy. Shin has studied violin since early elementary school. Both are members of the Huron High School Symphony Orchestra and several chamber ensembles. They both volunteer their time in mentoring string students at Clague Middle School. Finalists will spend five days in February in New York City learning from conductor Charles Peltz, working with other finalists, and getting a taste of the Big Apple. The Saturday, Feb. 19 performance is available to the public and specially invited representatives from collegiate music programs. The National Scholastic Press Association has named Community High School’s “The Communicator” one of five award winners in its Pacemaker 2010 in the newsmagazine category. In scholastic journalism, this award is referred to as the Pulitzer Prize for student newspapers. In addition, “The Communicator” and “The Communicator Online” placed in the Best of Show competition. The publication’s editors are Kyle Aaronson, Julia Kortberg and Katie O’Brien. The following student journalists received awards in the Write-Off competitions: Kyle Aaronson for Newswriting; Oriol Burgos-Tsoffar for Editorial; Acer Xu for Copy Editing; and Shadi Ahmadmehrabi for Podcasting. Teacher Tracy Rosewarne is the staff adviser. Abbot Elementary School students joined others from across the U.S. in Octobert to participate in “Read for the Record,” an attempt to set the record for the largest shared reading experience in one day. Students in Annette Stojcevich’s fourth grade class read “The Snowy Day” by Ezra Jack Keats and then drew a picture describing the words in the book. Last year, more than 2 million students participated in the event which is sponsored by JumpStart, a literacy advocacy group that promotes reading to young people. Mitchell Elementary School hosted special visitors from New Zealand in October. Professor Deborah Fraser of the University of Waikato and primary teacher Whakarongo Tauranga observed Mitchell teachers in the area of arts integration. Visitors shared their own experiences with Mitchell teachers during a book study group on the teaching of ELL students, and a luncheon at the school, sponsored by the University of Michigan. A collaborative effort between the University Musical Society and the U-M School of Education, these visitors also presented a workshop for teachers entitled “Mantle of Experts” at the Washtenaw Intermediate School District, sharing a unique model for integrating the arts. Cathy Reischl of the U-M School of Education arranged for the visit. The University Musical Society hosts a Monday, Dec. 6 discussion for teachers on “Free Play: Improvisation in Life and Art” by Stephen Nachmanovitch and will be led by the author The event takes place from 4:30-7:30 p.m. at the downtown Branch of the Ann Arbor District Library in the multi-purpose room, 343 S. Fifth Ave., Ann Arbor. The series encourages educators to expand and build upon ideas within the UMS season of events using relevant works of literature. In these facilitated sessions, teachers learn strategies for leading classroom book discussions. Registration is required. Call the University Musical Society at 734-615-0122 or e-mail umsyouth@umich.edu. Details: 734-327-4555. 826michigan, a local writing and tutoring nonprofit, hosts author Adam Schuitema in a writing seminar for adults. Proceeds from the series benefit the nonprofit’s free literacy programming for students ages 6-18, which serve Ann Arbor students and those from the surrounding areas. The workshiop “Beyond ‘Show, Don’t Tell’: The Visual Aspects of Good Fiction” is part of 826michigan’s “How To Write Like I Do” program, a series of workshops for adults taught by professional writers. Schuitema and workshop attendees will discuss what writers can learn from visual arts such as photography and film in order to enhance everything from a story’s settings to its characters to its development of scenes. • Forsythe English/Language Arts teacher and Curriculum Leader Jennifer Walsh, has been appointed to the Amelia Elizabeth Walden Book Award committee given out by the Assembly on Literature for Adolescents with the National Council of Teachers of English (ALAN). Her appointment is for two years. • Logan Elementary School teachers Katy LaCroix, Amy Patrosh and Heather Gray were selected to have Environmental Educators from the Ecology Center teach lessons to their students regarding the importance of preserving the environment. Last year Logan earned Emerald status as a ‘Michigan Green School’ and continues to seek environmental learning opportunities for students.